I cut out the Celebrate from a sheet of plastic in the recycling, and the Party Banner out of white card-stock. I adhere the Party Banner and the Celebrate with liquid glue, I used versa mark ink and heat embossed the stamped words in white. I adhere down the red cardstock onto the white base. I added some white pearls in each corner. musical person or teenager in your life!! 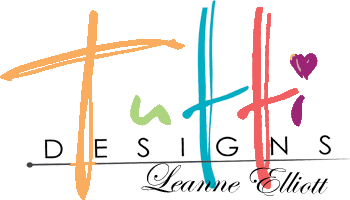 Tutti Designs Drum Set die. 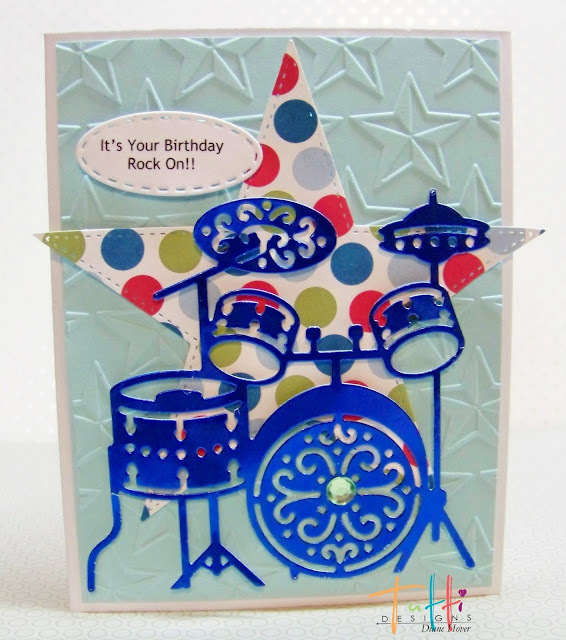 The first card was created by embossing a star background. then using the Nesting Stitched Star for the drums to 'rest on'. Of course as you can see the Drum Set was cut from a bright lime green glitter paper. Vicki here with you today. 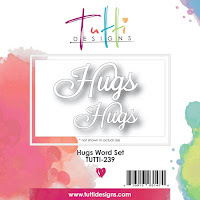 Welcome to a new week of inspiration on the Tutti Designs' Blog! 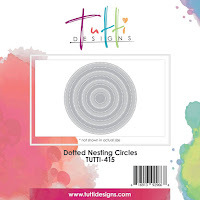 Today I'm sharing a "think Spring" card using the Tutti Designs Dotted Nesting Circles, Hugs Word Set and Tulip Panel. Tulips are always a sure sign of Spring. 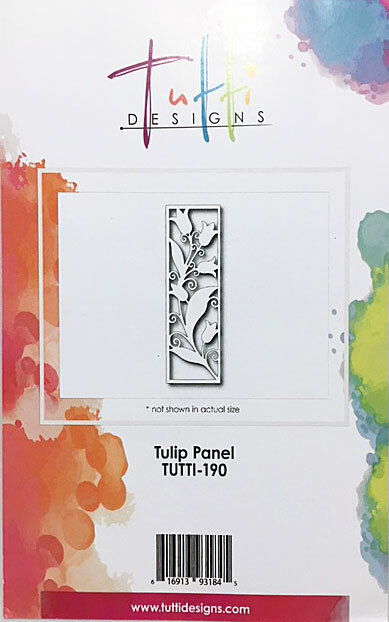 I restrained myself from a square card when creating this one so that the Tulip Panel, which is 2" x 6" would have a large background. 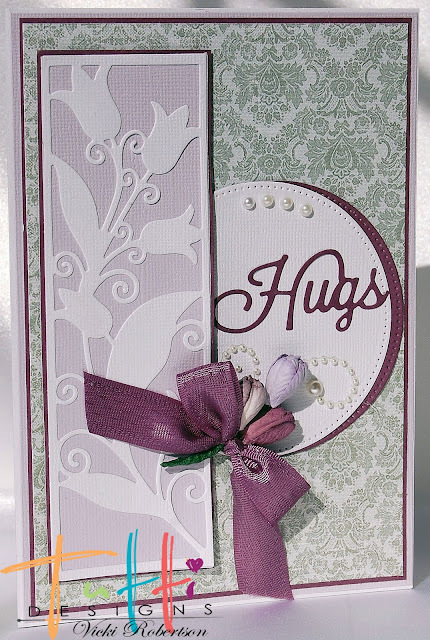 This card is 5" x 7" in size with a white card base layered in lavender and dusty purple cardstock. 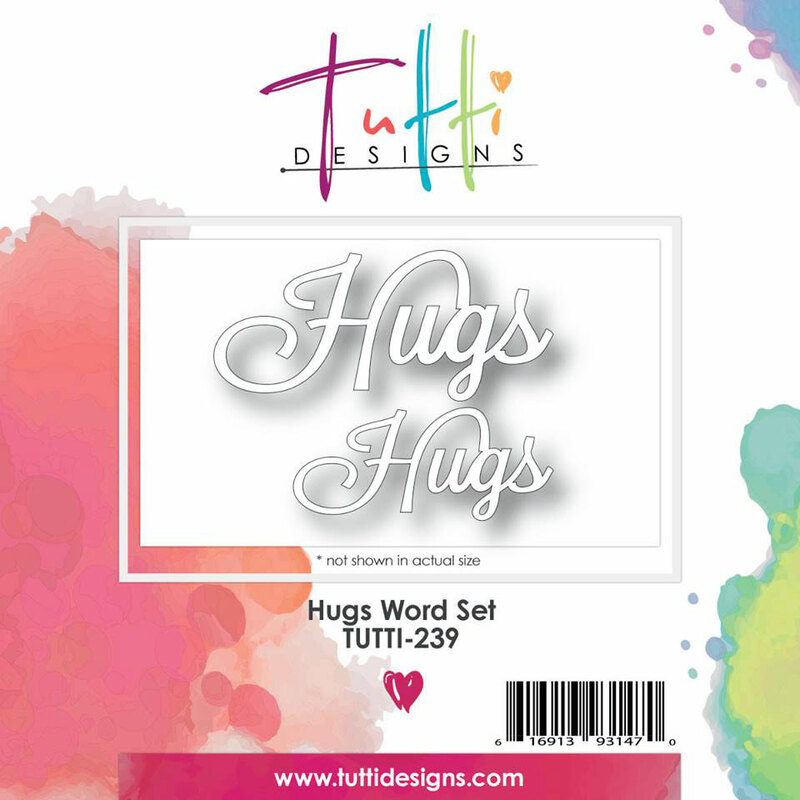 I also used it to mat the white Tulip Panel and to make the Dotted Nesting Circles behind the Hugs sentiment. The green patterned paper was a great compliment to the shades of purple and the flower stems. I added pearl accents around the sentiment and three tulips tied with a matching bow. 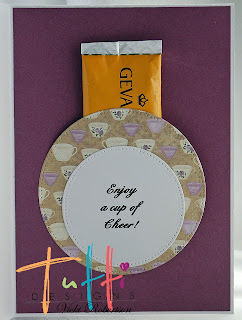 Inside the card, I made a pocket with the Dotted Nesting Circles and added a cup of cheer...Gevalia Cappuccino, a favorite of mine. Hello there, Jenn here to share a shabby little happy day card with you! 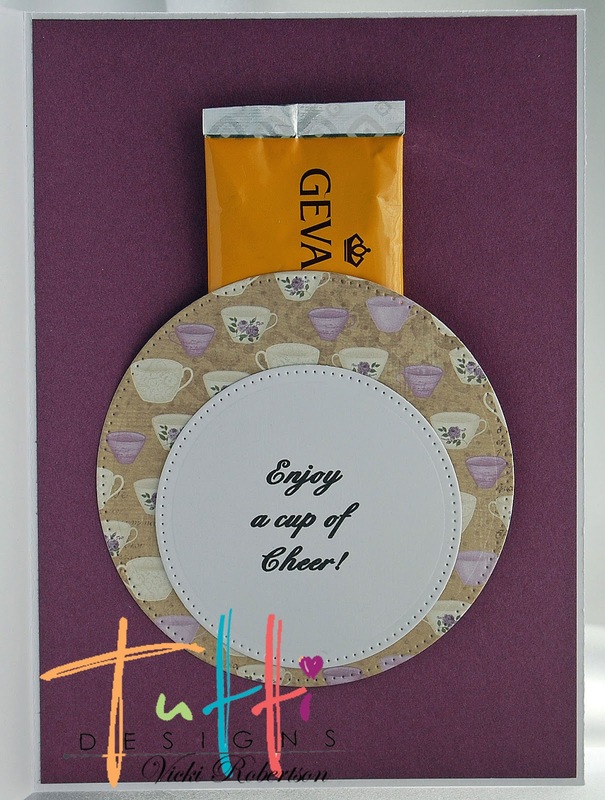 This card can be used as friendship card, Birthday card, Easter card or just a note to say hello! 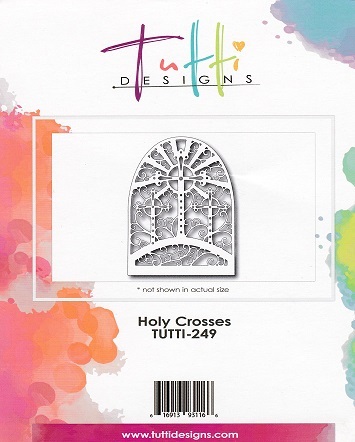 The amazing Tutti Designs Dies are great to create cards because they cut so well and the detail is just wonderful! 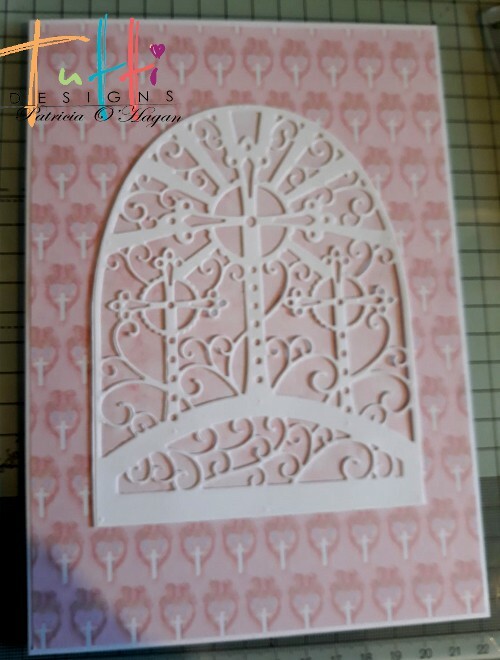 Cut a sheet of 8 1/2" X 11" to 10" x 7"
Score in the middle at 5", fold and burnish This is your card base. 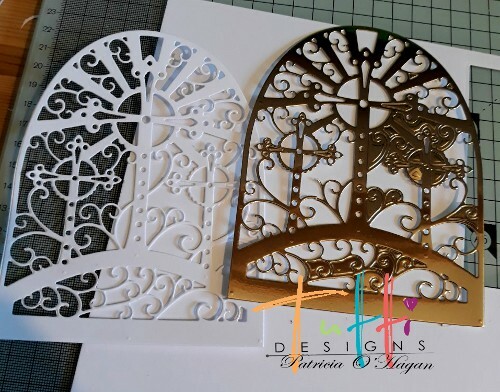 Most 12 X 12 designer paper stacks have pages like these with lots of images to cut out. 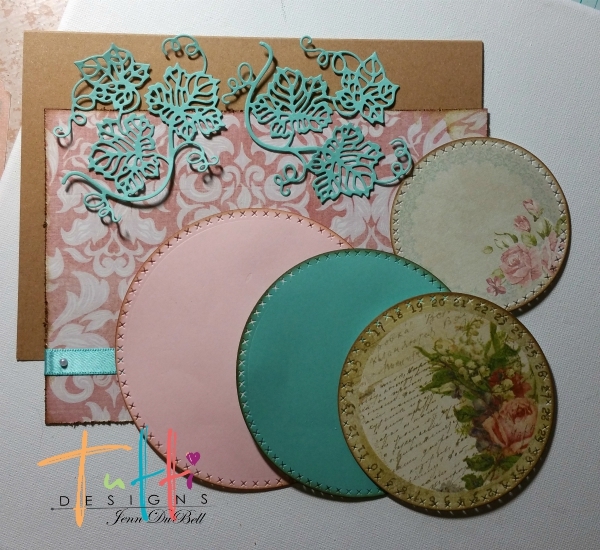 You can also use patterned paper as an alternative. Cut from one 12 X 12 sheet of designer paper - 2 - 4 3/4" X 6 3/4"
These are for the front and inside of the card. 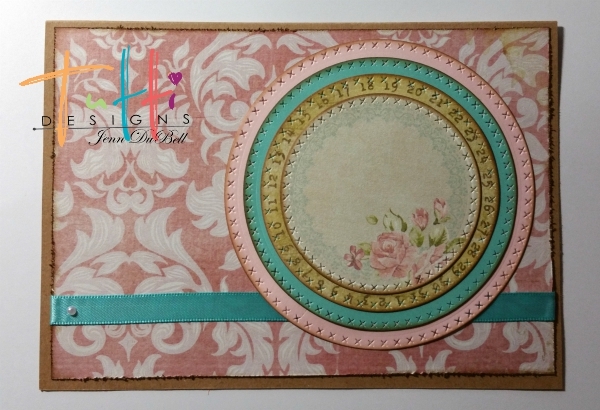 Cut a strip of ribbon to accent the front of the card and adhere it with tape runner or paper safe glue. Start building the circles by adhering them with tape runner and layering from the largest on the bottom to the smallest on the top. 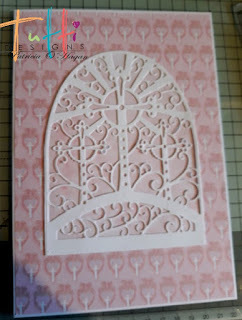 Use a glue stick lightly on the vine die cuts and adhere them to the card next. Using the same accent ribbon color tie a nice bow. 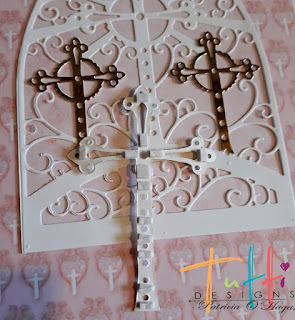 Gather the bow, flowers, small adhesive pearls, and chipboard embellishments and adhere them as shown. For my flowers and bows, I like to use the hot glue gun to assure that they have a strong hold. 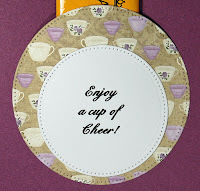 My chipboard embellishments were self-adhesive. 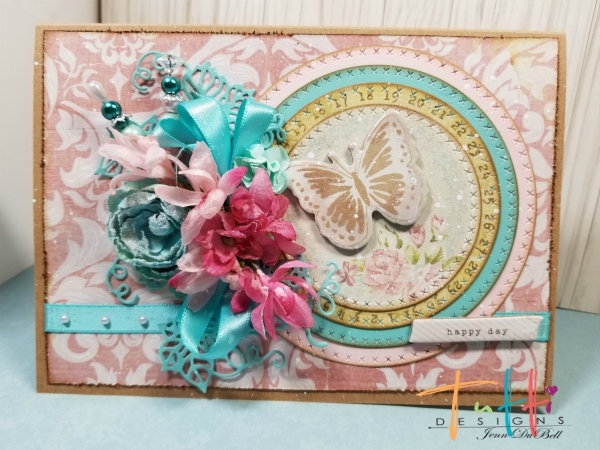 I added a light amount of embossing ink on the edges of the butterfly, sprinkled with pink iridescent embossing powder and set it for an extra twinkle. A few splatters of white acrylic were also added. I added a couple of stick pin pearls from my created stash of them as an accent. 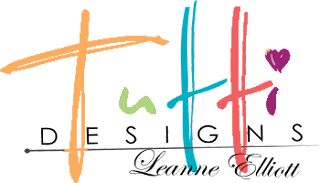 Thanks so much for visiting the blog and viewing my post today! 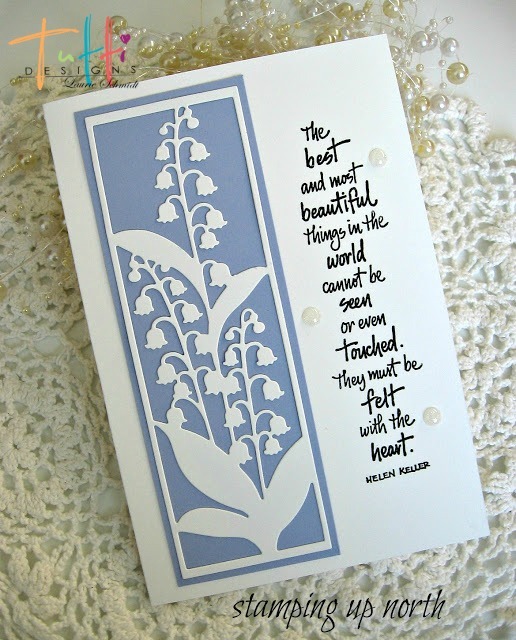 I hope that you are now inspired to create some beautiful cards too! 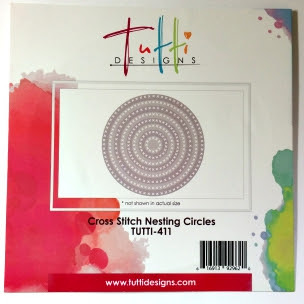 Here are all the Tutti Designs links for your convenience! which was perfect for my needs. I cut the die out twice. One in white the other in gold mirri card. 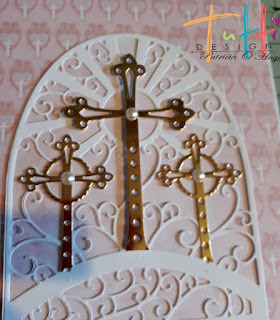 I matted the white Holy Crosses die cut onto some pale pink paper. Holy Crosses die cut in position. of the white die cut and added 3d squares to the centre cross to give it some depth. 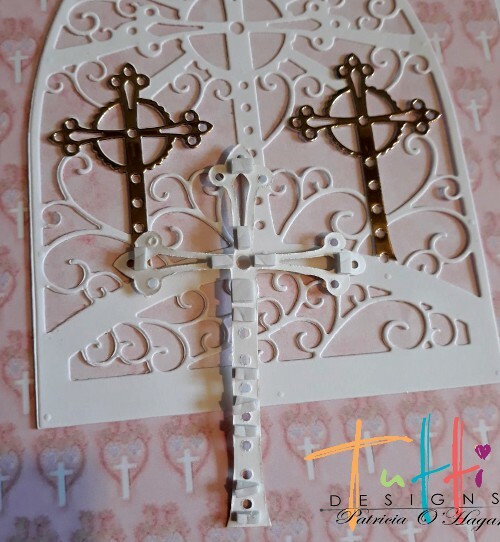 I then added pearls to the centre of each cross. 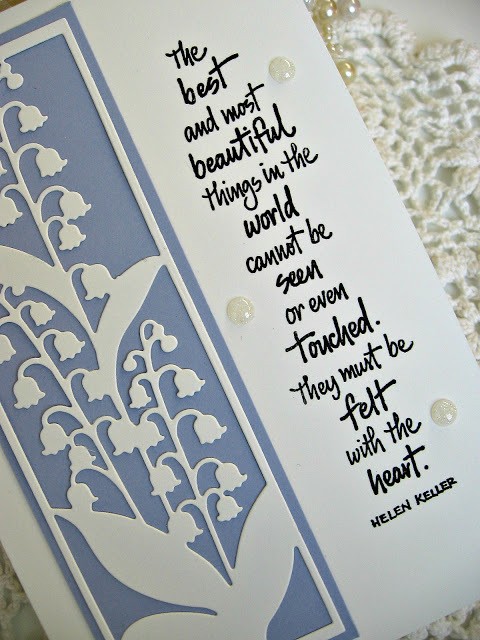 and pearls and the sentiment. 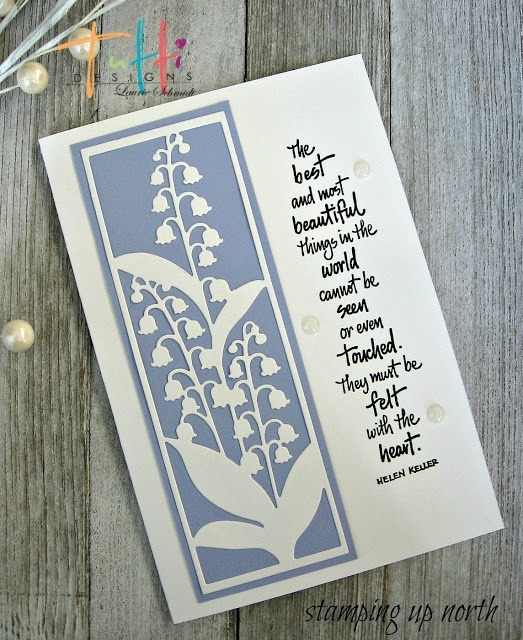 Hi everyone...Laurie here from Stamping Up North! Lilly of the Valley reminds me of spring. They are such pretty little flowers,and of course the smell...oh my..I can't wait for mine to bloom! I love to put a small bouquet in my tiny crystal vase. I set them on the window sill, and they look so pretty. If you love them as much as I do, you will want Tutti Designs Lilly of the Valley border die! It's really gorgeous. I made several cards with this die, and today I'm sharing a very clean and simple one. The die itself measures 6" x 2", so my card is 6 1/2 x 4 1/2 . All I did was cut it out in white, and back it behind some lavender paper. 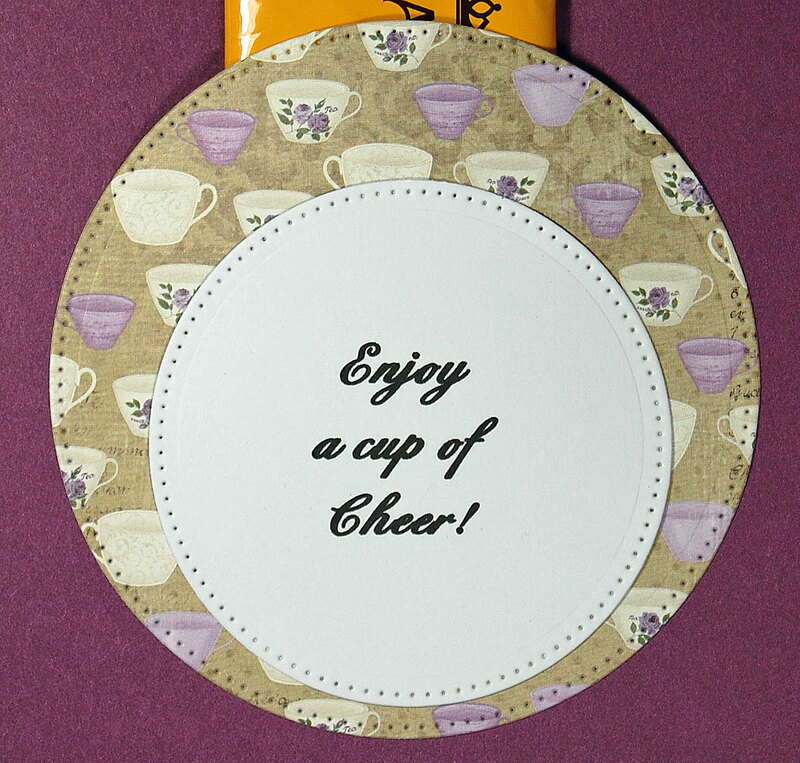 Then I stamped my sentiment and added some enamel dots. Hello friends!! Giovana here today with a super cool birthday card! 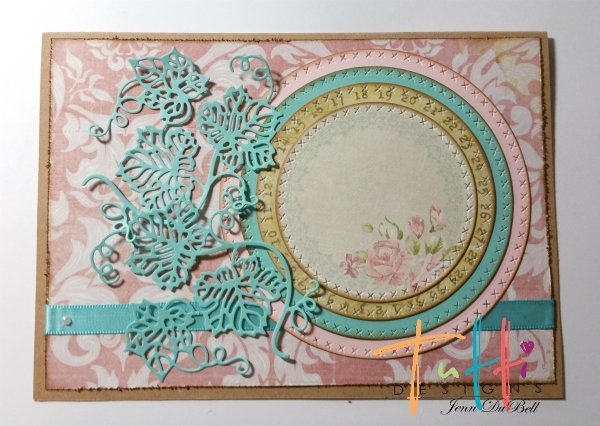 Love how this card turned out, love all the dimension from the Happy Birthday die! 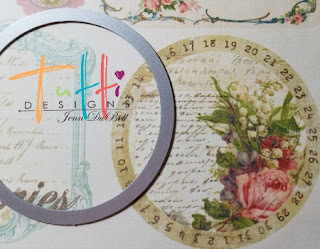 First, apply double sided adhesive to a sheet of white cardstock, then die-cut 4 Happy Birthday Circle. After that, carefully adhere all 4 together. Adhere the Happy birthday piece to the yupo paper. For the cardbase prepare a 6" x 6" card from white cardstock. Score each side at 3/8" and 1/4". Adhere piece to card base. 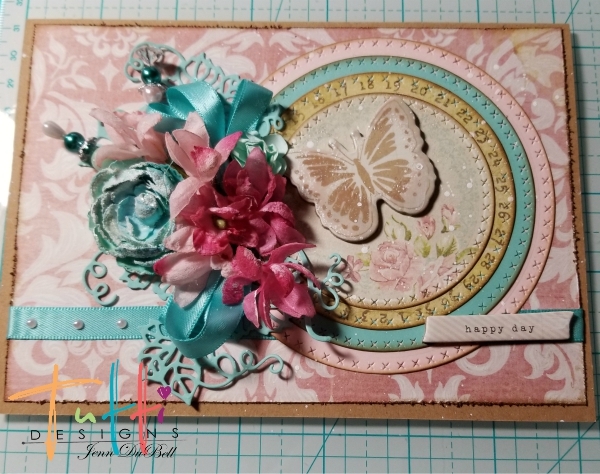 Embellish card with twine, rhinestones and sequins. Here is the front look of the card. Labels: Giovana Smith, Happy Birthday Circle, Scallop Stitched Nesting Circles. I cut out the three celebrate word from the burgundy card-stock, and the leaves background from the green, the fir branch out of the brown. I stacked the three celebrate words together using liquid glue. 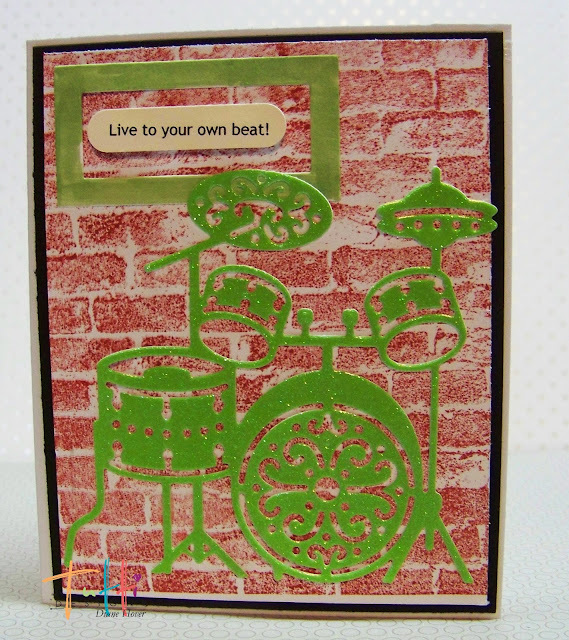 I adhered the green leaves background to the card base. 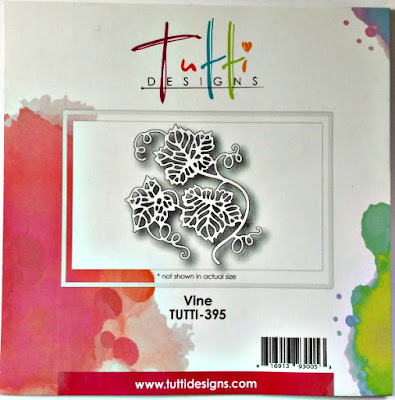 I adhered the fir branch to the green cardstock, adding the flowers using glue dots, and in the middle of the small flowers added a tiny pearl. I then adhered the Celebrate word to the green.